I like social network sites but I do not want too much, I mean sometimes I feel it is overwhelming. To be honest, sometimes I want keep quiet. You know social network is a open society that it is very good for social communication, but in other way, you will lose some private. For example, your personal information, photos, videos will be searchable for most search engines. If you do not want over social, or want a personal space for you, your family or some closed friends, maybe Shwup is good for you. This is a web space that can not search by search engines, so it is very good for you build a personal space. You can store your personal photos, videos, without interrupted by other people. It supports some image formats such as JPG, BMP, GIF and PNG; and video formats such as MPG, MPEG, WMV, MOV, AVI, QT, 3GP and MP4. 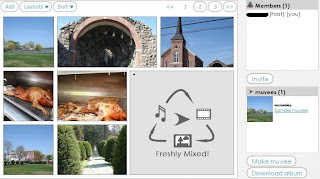 You can build your own photo and video album, and limited share them with your friends. The good pint is if you want share it with somebody you can send him a link, he does not require to register with Shwup. That is difference between Shwup and other online community. Shwup is belong to Muvee that is a commercial desktop software company. It also has other features like make photos slide show.